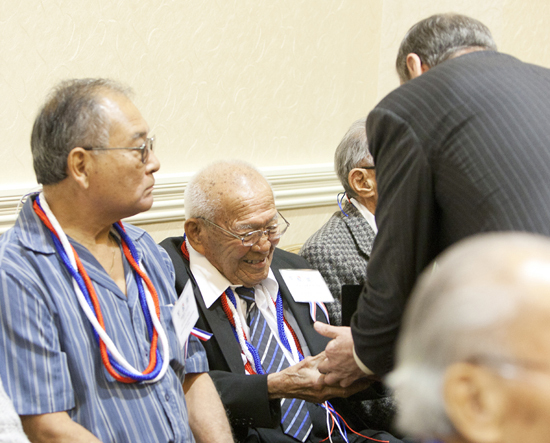 SAN DIEGO — Nisei veterans of the 100th Infantry Battalion, 442nd Regimental Combat Team and Military Intelligence Service were honored at a Congressional Gold Medal celebration on March 11 at the Crowne Plaza Hotel in Mission Valley. This was one of several regional events being held nationwide for World War II veterans who were unable to go to the Congressional Gold Medal presentation in Washington, D.C. last November. About 538 people attended the San Diego luncheon, where 17 veterans and 42 family members received bronze replicas of the medal. Marianne Kushi of NBC San Diego served as emcee. The opening prayer was given by Chaplain Peter Ota (U.S. Navy, retired). A moment of silence was observed in memory of the victims of the earthquake and tsunami that struck northeastern Japan on March 11, 2011. The presentation of colors was conducted by the March Army Reserve Honor Guard. The Pledge of Allegiance was led by Ron Krause, commander of Asian Pacific VFW Post 4851. A wreath was presented by the 100th Battalion 442nd Infantry Regiment, an Army Reserve unit from Hawaii. Greetings were delivered by Linda Marumoto McLemore and Robert Ito, co-chairs of the CGM San Diego Committee; Linda Canada, president of the Japanese American Historical Society of San Diego; David Kawamoto, national president of the Japanese American Citizens League; and Karen Tani, president of the San Diego JACL. 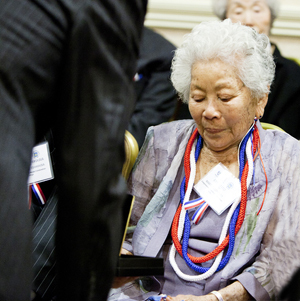 Christine Sato-Yamazaki, chairperson of the National Veterans Network, was scheduled to speak but was unable to attend as her grandfather, a 442nd veteran, passed away the night before the event. In a message to the attendees, she explained how last year’s ceremony came about: “From 2009 to 2011, the National Veterans Network embarked on a nationwide two-year campaign to work on the passage of the Congressional Gold Medal bill in Congress, followed by the design of the medal with the U.S. Mint and a three-day celebration in Washington, D.C.
“We know that due to the age and health of World War II veterans and next of kin, many were not able to travel to the nation’s capital. Thus, it is wonderful to see that the San Diego community has come together to honor your courage, sacrifice and patriotism to country. The Congressional Gold Medal dates back to 1776, when it was awarded to George Washington. It initially recognized valor in battle, but was broadened to include contributions in other fields. Recent recipients include the Women Airforce Service Pilots, the Native American Code Talkers and the Tuskegee Airmen, all of World War II; Apollo 11 astronauts Neil Armstrong, Buzz Aldrin and Michael Collins; baseball star Jackie Robinson; Rev. Dr. Martin Luther King Jr. and Coretta Scott King; the Dalai Lama; and Burmese human rights activist Aung San Suu Kyi. Proclamations and resolutions were received from, among others, San Diego Mayor Jerry Sanders, the San Diego County Board of Supervisors, Sen. Dianne Feinstein (D-Calif.), House Speaker John Boehner (R-Ohio), Rep. Brian Bilbray (R-Solana Beach), Rep. Duncan Hunter (R-El Cajon), and Assemblymember Marty Block (D-Lemon Grove). “A Letter to Dad,” a video produced by event co-chair Ito, was screened. The narration, read by actor/writer Lane Nishikawa, is a letter from Ito to his late father, a 442nd veteran, lamenting the fact that the two never discussed what happened during the war. The video contains pictures of San Diego veterans of the 100th/442nd and MIS. It has been posted on YouTube, and organizers are in the process of getting funding to have copies of the video made for the veterans’ families. The veterans and family representatives received the medals from Rep. Bob Filner (D-Chula Vista), who was assisted by four members of the 100th Battalion, 442nd Infantry Regiment: Maj. Keith Horikawa (commanding officer), Specialist William Lurbe, SMA (Sergeant Major) Beau Tatsumura and Sgt. Christopher Arakawa. The recipients’ names were announced by Michio Himaka. Stacy Yamamoto sang “God Bless America,” Rev. Jim Yanagihara (retired) from Buddhist Churches of America gave the closing prayer, “Taps” was played, and the honor guard retired the colors. Closing remarks were given by Ito on behalf of the organizing committee, which also included Gwen Momita of the Tag Project/Executive Order 9066 and Roy and Alice Asaki, who handled registration and reservations. During the weekend, JAHSSD also hosted an inaugural celebration of San Diego State University professor Wendy Maruyama’s Tag Project, which is based on the tags and ID numbers that were issued to Japanese Americans on the West Coast when they were rounded up in 1942. Activities included a hospitality reception on March 9 and a Tag Project/EO 9066 unveiling and luncheon on March 10. Maruyama explained, “I was taken by the physical weight of the tags when they were completed and hung, despite appearing to be light and airy. This struck me as being very relevant to the way the internment was perceived by the general American public. To this day it shocks me to still run into fellow Americans who had no clue that this had happened. It was necessary to make all 120,000 tags, to represent every Japanese American who was sent to the ten major camps. For more information, visit http://tagproject.posterous.com/.